That sums my concern with the Tea Party movement. I have yet to hear how they would actually propose to reduce taxes and balance the budget. One Tea Party supporter, Stephen Fincher who is a farmer has received farming subsidies. The Washington Post article states: "The one possible chink is the farm subsidy issue, a topic that makes Fincher and his team sensitive. According to data compiled by the nonprofit Environmental Working Group, Fincher and his wife, Lynn, received about $2.5 million in subsidies between 1995 and 2006. But Fincher said that without that money, his farm would have shut down years ago." (emphasis added). Unfortunately, this ends up being another typical example of welfare for me is OK but we have to cut welfare for the other guy to balance the budget. Obama is currently doing his best to pay off as money non-contributors to society as possible so that the welfare state may be expanded beyond sustainable limits. What few fail to recognize (at least, those who are the beneficiaries of the welfare state) is that expansion will lead to bankruptcy of the United States and the biggest debt default in the history of mankind. Perhaps only through catastophe will people wake up to the fact that you cannot take more and more (and more) from those who actually contribute to society and give to those who do not. I think we are in agreement that Obama is paying off non-contributors (Bread and Circuses). However, I may not have been exactly clear in my post, that the Tea Party Movement lacks a coherent message as to how the Federal budget would be balanced. All I hear is shrill rhetoric but nothing substantive. Furthermore, I have to really wonder about the credibility of those behind the Tea Party Movement. Is Mr. Fincher is a typical member who is actually clueless concerning his receipt of welfare? If the Tea Party Movement is made up of unthinking buffoons who don't realize what a balanced budget would mean, then we will continue to spend ourselves into oblivion. Now for the flip side. It seems that the Washington Post and the New York Times are trying to smear the Tea Party Movement as being racially motivated! Playing the racial card is disgusting. If you want to discredit a movement, do some real investigative journalism don't run a smear campaign based on innuendo. The Post and Times should be interviewing the Tea Party Movement leadership and asking them "How do you propose to balance the Federal budget? Do you believe in a flat tax? What would be an acceptable tax rate?" That is what we should be discussing. If the Tea Party Movement leadership cannot provide rationale answers to those questions,they will self-destruct. Actually, wouldn't a better caption be "No thanks, I'm a Keynesian!" Just think about all the construction workers who will benefit from rebuilding his house. Gee, I was under the impression that the Tea Party Movement was more of a grass roots thing. I have yet to see any racial or radical elements. I think people are just pissed that the government is spending money like a drunken sailor. The new mantra of the middle class should be "stop the spending." True, their agenda is poorly formed, but the end game is the same: reduce government spending. I know, when anything is that vague it is difficult to get a handle on where they are going. Many good causes flounder because they focus on the end goal without providing any of the steps to get there. And what, pray tell, does a hoary old star trek episode have to do with the price of tea in China? Nonsense. 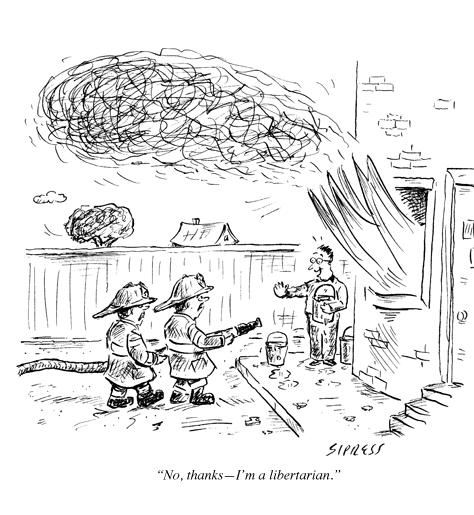 In fact it is ONLY libertarians who are entitled to receive government payments or services. For us, it's restitution. For others, it's participating in theft that they support. This tired old argument again? He has Gresham's law wrong. Should I laugh now or wait for the punchline? I skimmed his paper. He should take econ 101. Seriously. It was written three years before the mortgage meltdown but seems eerily prophetic about it. Assets that are hard to assess. Companies look perfectly solvent from the outside right up until the bottom drops out. Lax regulation of the sector. Public-sector fraud abetting private-sector (bailouts, anyone?). The major failing there is that it does not have the guts to name George W. Bush as an example of a head of state committing fraud, although by 2005 Bush had already used the Iraq war (and its fraudulent pretext of "WMDs") to funnel billions to Blackwater and other companies, and the WMDs were already known not to actually exist in Iraq. Time to resurrect this cartoon and its implications. See No Pay, No Spray?. Fox News actually got the story implications correct! Amazing.